The adult cat has 30 teeth: 12 incisors, 4 canines, 10 premolars and 4 molars. The large, curved, pointed canines are important for stabbing and clasping while hunting. The premolars are like scissors which slice the prey into pieces that are small enough for the cat to swallow. Cats do not chew their food–they chop it up and swallow it. Cats that only eat commercially-prepared pet foods never have the opportunity to slice up large, tough food objects and their teeth may suffer as a result. (The fibers in fresh meat help to cleanse the teeth.) 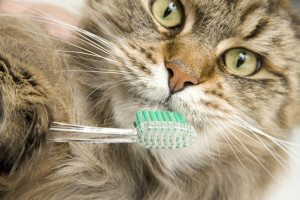 Consequently, many cat owners are working to get their cats used to having their teeth brushed. The steps involved in getting your cat to accept having his teeth brushed is much like the gentle and gradual process involved in introducing him to nail-clipping or any other routine examination needed. Long before the toothbrush is ever brought out, Kitty must be comfortable sitting on your lap while you tenderly massage their mouth and lip area. (You can sneak this into your petting session). When your cat is comfortable with you handling their face and lips, then start to rub the teeth and gums with your index finger. (Be sure your fingernails do not poke into the sensitive gums!) It is best to start with the canines (fangs) and those teeth just behind them. If your cat seems OK with this then you can wrap a piece of cheesecloth around your finger. It will probably be more acceptable to Kitty if it is smeared with something delicious. Some cats like the taste of the poultry toothpaste that is formulated especially for cats. Do not attempt to open Kitty’s mouth until he is completely comfortable with these steps. Some very relaxed cats will accept the introduction of a finger toothbrush (made especially for pets) or a 2-row child’s toothbrush into his mouth, but don’t push it. Every step of this procedure should be positive and accompanied by praise and rewards. Any impatience on your part will only delay the successful performance of this procedure. If you don’t think you have what it takes, then it is better to let your veterinarian take care of your cat’s dental hygiene. You don’t want to compromise the bond you have with your best friend.